Guys may not realize how important it is to keep nails properly groomed with the right mens manicure kit. Men’s nail care is as important as your hair, beard or skin. Why, then do so many men not get manicures or do them themselves? I think the answer is that men feel less than manly when they do their nails. To keep it manly, they just would rather bite their nails when they get too long and call it a day. The other reason is that men don’t have time to go and get manicures, or they lack the right mens manicure kits. In today’s busy world, adding another item to the to-do list is just another thing to procrastinate about. Do your own nails? Turns out not many men know how to do their own nails at home. Well, we have you covered there! High quality nail clippers are easy to use and most kits have everything a guy needs to do his own nails. In this article we will give you a quick rundown on how men should give themselves a manicure at home and what the best mens manicure kit for men are. If you don’t need a men’s nail grooming guide and want to cut to the chase, here is a table with the best manicure sets for men. For everybody else, keep scrolling to read up on how to take care of your nails and see what the best manicure tools for men are. Covers all the basics, and very well made. Has lots of accessories including other grooming tools. Ergonomic and well made. Plus it has other grooming tools. People who love the finer things. German craftsmanship at its best. A professional manicure or pedicure at home with ease. 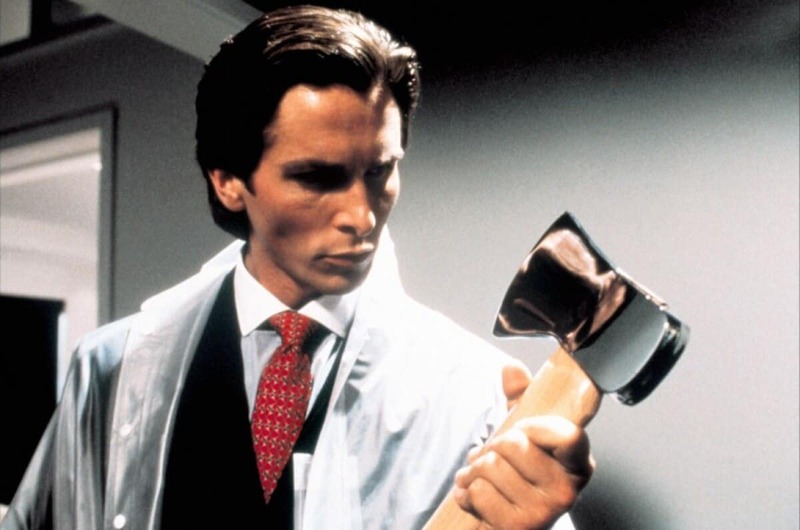 If keeping nails groomed was good enough for American Psycho Patrick Bateman, then it should be good enough for the rest of us. There are a couple of good reasons for men to do proper nail care maintenance using the best mens manicure kit. In case you’re wondering if anybody notices your nails, the answer is yes, they do. Just not having dirt under your fingernails does not mean that they look passable. There is a huge difference between trimmed fingernails and manicured nails. People will see that your nails look impeccable and treat you differently. We’re not just talking about first dates with a special lady friend. Whether on a date, at work or taking care of personal business, having manicured nails will determine how you are treated. Guys with well-manicured nails and using the best mens manicure kit will look more deserving of somebody’s respect and time. Men that work out or are athletes put their nails through a lot and it usually shows. When you are at the gym take a look at guys feet in the locker room. Without looking creepy, obviously. You’ll probably notice how many guys have chipped, ragged and really thick toenails. Running and playing sports with long toenails puts a lot of impact on toenails that are too long. Keeping them short can reduce irritation. This impact can ruin nails which make it more likely to cause infections or painful ingrown nails. Though most nail salons are kept very clean, there is always that place that will spread an infection or fungus that leaves you determined to never get a manicure or pedicure again. Doing it yourself at home is the best way to know exactly what equipment is being used and that it is properly cleaned. It should only take about 15 minutes to do this, so there really is no reason to have mangled nails! Soak nails first Since guys are usually pretty busy and don’t want to spend much time doing a manicure, the best way to get the nails soaked is to just do your nails after a shower. Moistened nails are easier to cut and less likely to rip while trimming. If you don’t need to take a shower then soak your hands in a bowl of warm water for 5 to 10 minutes. Use high quality nail care tools The best nail clippers are the ones that have a curved blade. This makes for a nice rounded edge. Clippers should be sharp and take little to no effort to cut through the nail. Make sure your men’s nail care kit comes with cuticle scissors. This will get rid of any of the fraying around the sides of the nails that are usually bitten off and bleed. A cuticle push stick will keep your cuticle in line and keep from getting frayed to begin with. Using a nail file with a coarse and fine side will keep the nails from being too sharp after clipping them and giving the nail a final shape. Start clipping Even when using a curved nail clipper, it’s important to not curve the edges of the nail too much. Keep the ends somewhat squared to avoid ingrown nails. Don’t try to cut the entire nail with one clip. Many guys use toenail clippers to do this, but it is better to go with shorter clips to avoid overcutting the nail. We all know the pain of cutting too close to the skin when clipping nails! Try to leave a little bit of the white edge of the nail too since we will be filing them at the end of the manicure. Cuticle remover Use cuticle scissors to cut off the frayed ends of the cuticle. You will recognize them since they have the tips curved up instead of straight blades. Gently cut away any of the hard bits of cuticle on the side of the nail where the cuticle joins the skin. Use the cuticle pusher to push any longer cuticles in. They look better and also are less likely to fray when kept in check. Use the end of the cuticle pusher to clean out any dirt from under the nails. Start filing Taking the coarse side of the nail file, gently and slowly file at a 90° angle. When the entire nail is done then hold at a 45° angle and repeat. This will bevel the edge of the nail and make it much smoother. Repeat the process with the fine grain side. Lube them up For stronger nails this is the point when you should add some product. You can use simple vaseline to keep the nails moist which will keep the manicure looking good and the nails healthy. But, the best thing to use is some argan oil from Amazon.com as it is the best oil to strengthen and hydrate your nails. That’s really all there is to it. It is so easy that it will easily become an essential part of your repertoire. Now, make sure you keep your tools clean. Wipe with a cotton swab wet with isopropyl alcohol and then make sure they are totally dry before putting them away. What should you look for in a manicure and pedicure set for men? The best fingernail clippers in the world are made in Germany and Japan. Any kind of sharpened steel instrument like scissors, or blades that come from there are usually the highest quality, so it is no surprise that they also make the best toenail clippers in the world, too. Nail clippers can be nickel plated or stainless steel. The only problem with nickel plated clippers is that they can chip or the plating can corrode. Some of the products on this list are, indeed, nickel plated, so make sure to always keep them clean and dry and in their protective case to keep them in top notch condition. Even though stainless steel doesn’t chip or corrode, the same precautions should be done with them as well. From Japan, this manicure set for men covers all the essentials. Made of high-quality stainless steel, the nail clippers for both fingers and toes, are very sharp and very durable. There is even a nose hair trimmer with the rounded tip to prevent any cuts to the inside of the nose. It may not be part of the manicure routine but it certainly is a nice addition. Little details are thought of with this kit. A rubber handle on the clippers helps to prevent wet hands from slipping. Under the handle, the whole top of the clippers is made of a nail file in case you’re clipping your nails on the go and don’t have the whole kit with you. The smaller nail clippers have a straight blade while the toenail clippers have a slightly curved blade. All in all, this is a set made with care from high-grade material. 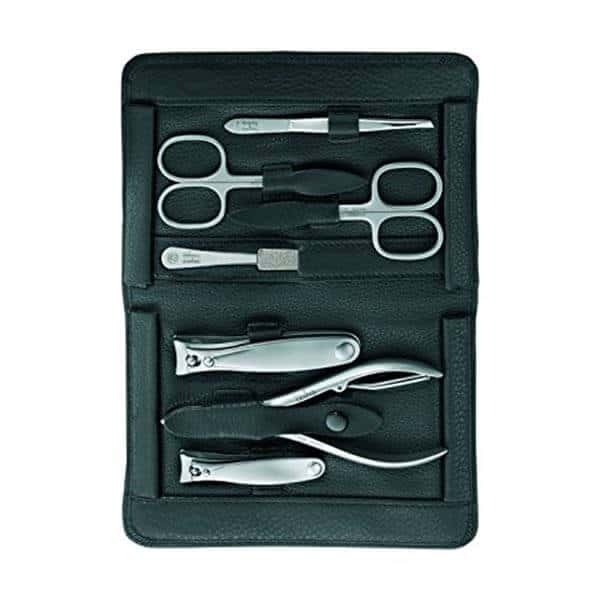 This mens manicure kit includes: Nail buffer (3 pieces), nail scissors, nail nippers, cuticle scissors, stone nail file, sapphire nail file (fine and coarse coating), blackhead remover, hoof stick, callus remover, 10 spare blades, toenail clipper, fingernail clipper, tweezers, nail scratcher, nail cleaner, nail pusher. Founded in 1927 in Solingen, Germany, the center for cutlery manufacturing, this manicure set is made of the finest materials by actual craftsmen. 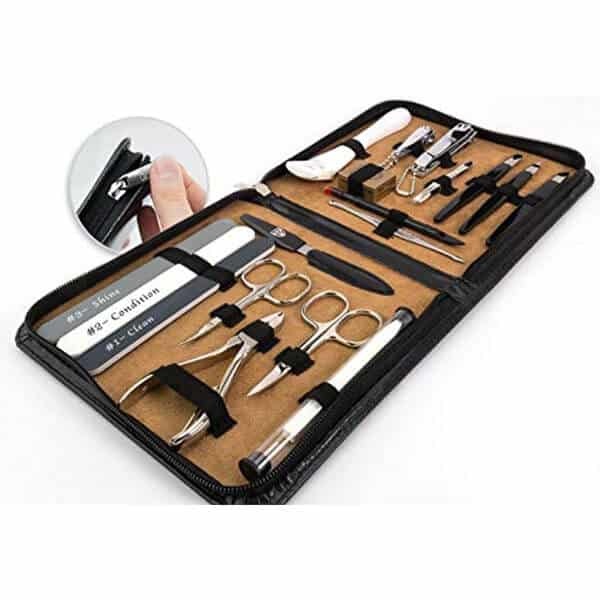 This mens manicure kit is so extensive that it has everything you would need to do a professional style manicure at home. Even items you didn’t even know you needed! Both the fingernail and the larger toenail clippers have a slightly curved blade that is exceptionally sharp. 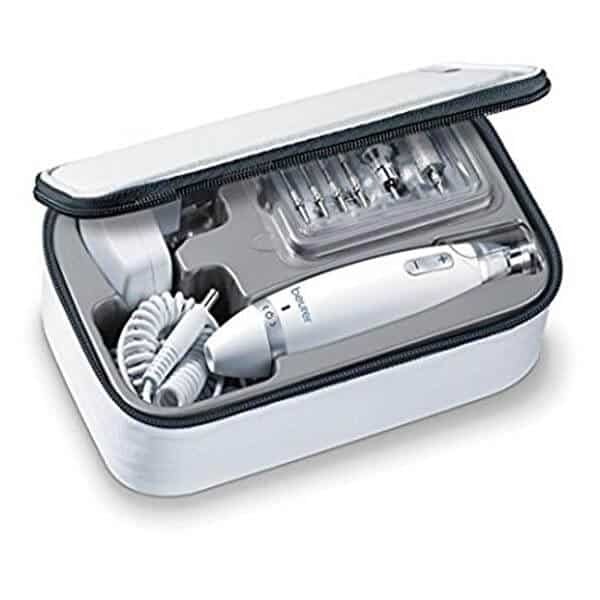 For those that suffer from calluses on the feet, there is a handy callus shaver complete with ten extra blades. There are three scissors, straight blade nail scissors, curved blade cuticle scissors and nail nippers, which are meant to cut the thickest nails like damaged toenails. Three nail files are neatly labeled according to its job. A hoof stick may have a funny name, but it does a great job at keeping the cuticles in line and looking sharp. There may be a lot of pieces to this kit, but they all fit compactly in the quality leather case. Great for travel, too. 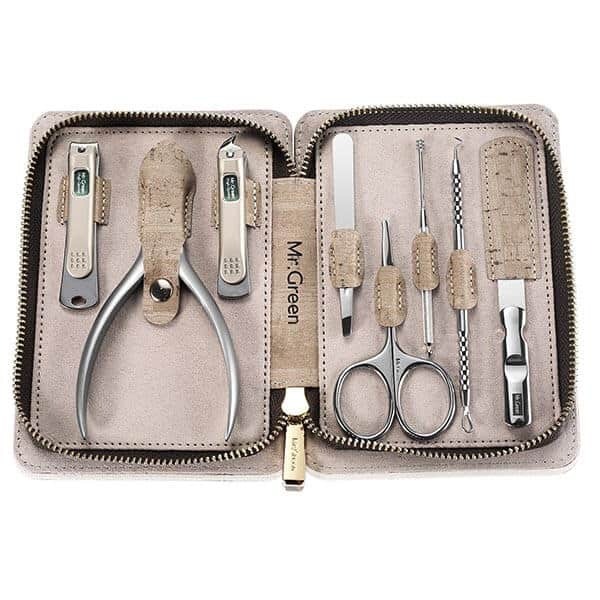 This mens manicure kit includes: Precision Fingernail Clippers, Precision Toenail Clippers, Nose Hair Scissors, Nail File, Ear Cleaner, Tweezers, Acne needle. Though this mens manicure kit is not made in Japan, these tools are made of high quality Japanese stainless steel with a high carbon content. The stand out in this set is the toenail clippers. With an oddly shaped cutting blade, they are not only sharp but very strong. They excel at cutting through even the thickest and toughest of toenails with ease. The way the clippers are designed helps the cutting edge really get right through the nail without any real effort and results in a very clean cut. To complete your grooming routine there is an included acne needle with a lancet to prick through whiteheads without scarring and the other end will gently remove blackheads. This mens manicure kit understated carrying case has a nice aesthetic that is a departure from the typical case that looks like it came out of your grandmother’s closet. 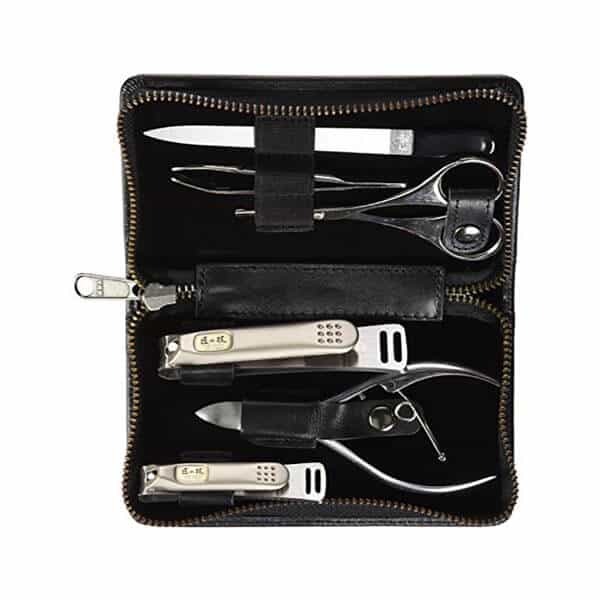 This mens manicure kit includes: Tweezers, Cuticle Scissors, Nail Scissors, Metal Nail File, Fingernail Clippers, Toenail Clippers, Nose Hair scissors. This may seem like a lot of money for a set of nail clippers, but when you consider the fine German craftsmanship, it is meant to last a lifetime. 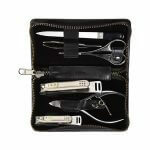 This manicure kit for men is handmade in Solingen, Germany with the finest high carbon steel. The clippers are perfectly balanced and feel so solid in the hand. They are very sharp and can keep an edge for years. For an all in one tool, there are the nail scissors that do double duty by cutting easily through nails and then gently taking care of frayed cuticles. Even the tweezers are such a pleasure to use as they are so well designed they can grab just about any tiny splinter. You may not be a professional, but your work of grooming your nails is made so easy by the excellent craftsmanship of this kit. When you really want the best, then these could very well be the best fingernail clippers in the world. This is ideal for the men who appreciate quality and the finer things in life. For a professional quality manicure or pedicure, there is this powerful nail drill that is also easy to use. There are no clippers or scissors. It’s a simple grinder tool that literally grinds your nails down. Each attachment has a different function from grinding away the nail to pushing back the cuticle. There are ten different tools included. To keep from making a mess this mens manicure kit has a dust shield. To be honest, it is actually fun to use one of these pedicure and manicure kits! If you’ve ever used a Dremel tool then you already know how to give yourself a manicure with this. With an LED light to see the small details and adjustable speeds, this manicure kit for men is super easy to use. Hopefully, this article inspired you to go out and get yourself set up with a great manicure kit or pedicure set for guys. Once you start getting compliments on your nails, you won’t have a problem making taking care of your nails a part of your overall grooming routine!